Physicists are not always concerned with exact solutions to problems. Oftentimes, an approximate solution to a problem or an approximate mathematical expression is good enough for practical purposes. Using approximations can also greatly simplify the appearance of a mathematical expression, so that the expression can be interpreted more easily. Furthermore, in many situations, it is impossible to write down an exact solution in "closed form." In this article, I introduce two of the most popular techniques that we use when making approximations. Examples are also provided. In some cases, it may be better to keep the quadratic term or even the cubic term until near the end of the derivation. Typically, these situations arise when the approximated function will later be differentiated. The constant, , is the maximum value of (the amplitude of the pendulum swing), and is a phase angle, which tells us the position of the pendulum at the time origin, . Since this derivation relied upon the assumption that , the final expression is only a good approximation when . The other popular method of approximation is called perturbation theory. It can be applied in situations for which the problem that we are trying to solve is very similar to a simpler problem, except for a minor complicating factor, called a "perturbation." For instance, using Newtonian gravity, it is easy to compute the position of a planet orbiting a star if the stellar system consists of only one star and one planet in isolation. On the other hand, introducing a third body complicates the situation; the presence of a moon, another planet, or a companion star causes the orbits to no longer be strictly elliptical; it perturbs the orbit. 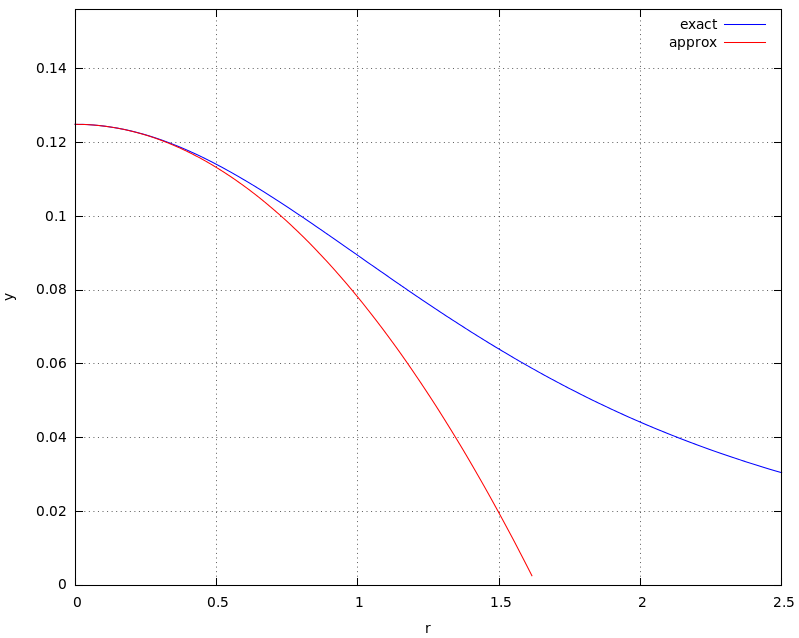 Perturbation theory can be used to estimate the effect of the complicating factor (the perturbation) as long as this factor only changes the physical situation in a small way. is a small modification (perturbation) to the situation , and is a small modification to the result, . The physical situation could consist of the positions, velocities, and masses of a star and a planet, along with a force law. In this case, the result might be the position of the planet as a function of time. In other cases, the physical situation might involve the density, temperature, and pressure of a fluid or the positions and velocities of particles in a particular electromagnetic field configuration. The situation could be anything that leads to a computable result. There are several varieties of perturbation theory, but they all share this general assumption. such that all of the relevant physics (the laws and the description of the physical system) are included in this equation. The result, , is then the solution to this equation, which we have denoted abstractly by . In other words, is the quantity that you wish to compute. Equation (1) is oftentimes a differential equation, but it could also be an algebraic expression. Thus, is generally a function or a number. where is the solution to the exactly solvable situation in Eq. (1). Typically, , so the only term that is not negligible is the term that is linear in . Where The exponential term can be thought of as a perturbation to the trivial equation . This perturbation will cause the solution to differ slightly from the unperturbed solution ( ). Perturbation theory can be used to approximate the solution near ; any additional solutions will need to be determined using other methods. Perturbation theory is useful only if you are looking for the root of the perturbed equation that falls near the root of the unperturbed equation ( ). There is another solution at , which would require the use of complex analysis or a root-finding scheme. where the wave vector points in the direction of wave propagation and has magnitude, (where is the wavelength of the wave). The angular frequency, , where is the ordinary frequency. The constants and determine the amplitude and phase of the wave, respectively. which is of order would not be negligible. From this, one might expect waves caused by violent explosions (or, generally, by very fast-moving objects) to behave in more complicated ways than the typical sounds that we encounter in everyday life. To study the problem in more detail, a quadratic term could be added to Eqns (7). The modified equations would then be substituted into Eq. (4), Eq. (5), and Eq. (6). Then, the terms would be collected and we would attempt to solve for . Upon attempting to do this, we would find that additional assumptions (or data) about the disturbance are needed in order to learn something new about the behavior of the system. This example is based on a derivation found in the appendix of Galactic Dynamics by Binney and Tremaine.